More than 300 national advocates, elected officials, stakeholders, journalists and prominent members of the Puerto Rican community came together to outline the issues that Puerto Ricans living in Florida are facing and to examine the role that such residents might play in the future of the state. The “Nuestro Futuro” Symposium, held on June 30, was a collaboration between FIU and the Puerto Rican Alliance of Florida and the Puerto Rican Leadership Council of South Florida. The gathering, which was co-sponsored by the Steven J. Green School of International and Public Affairs, aimed to demonstrate the impact of the Puerto Rican population in the Sunshine State. 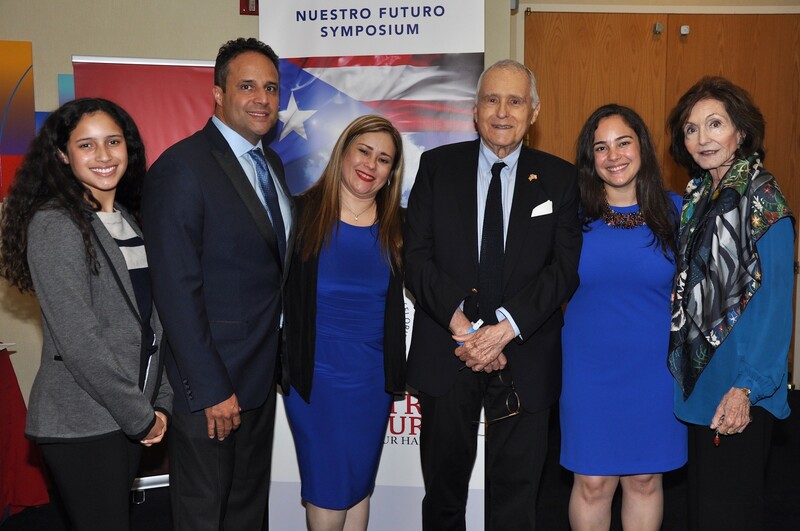 In addition to sharing information, the symposium helped raise more than $50,000 for the Maurice A. Ferré Educational Fund, which supports Puerto Rican students who currently attend FIU. Puerto Rican-born Ferré, a former six-term mayor of the City of Miami and the first Hispanic mayor of a U.S. city, is raising money for more than 700 students displaced by Hurricane Maria. At the symposium, Ferré was recognized with the San Felipe del Morro Award. Also receiving the honor was Antonia Novello, the first female and first Hispanic surgeon general of the United States. The symposium made news with the presentation of the first-ever study on Puerto Ricans in Florida. It involved a survey of 1,000 residents around the state who have arrived from the island since 2011. The study was commissioned and sponsored by the Puerto Rican Alliance of Florida and conducted by FIU professors Eduardo Gamarra and Jorge Duany. The findings were unveiled as part of a panel with other experts on the Puerto Rican diaspora. The main cities of residence are Orlando, Tampa, Miami and Fort Lauderdale. The main reason that Puerto Ricans leave their homeland is for job opportunities. The majority plan to stay indefinitely. The most difficult challenge the newcomers face is speaking English.